We Perform very through inspections, but mostly we help people. 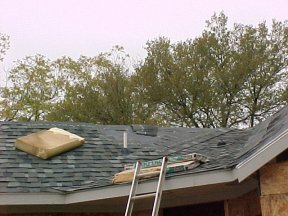 We climb up to and walk any roof that is safely accessible, we check for damaged and missing shingles, missing flashing, improperly installed flashing, unsealed flashing, improper flashing material. Roof penetrations such as soil stacks and vent stacks are also observed and reported if they are damaged, missing, or need sealant. Sufficient ventilation to the attic and roof are observed. Inspectors check for improperly installed ventilation, insufficient ventilation, no ventilation. The gas vent stacks are leaning. It is possible to have rain water track down the vent stack cap and leak inside of the hetaer burner compartment. We had this corrected before our client moved in to their new home. Valley has been weaved into each side of the valley. This makes it harder to leak at these points. The roofing company was installing the roofing materials with the wrong stagger we had the installation stopped and the roof was completely removed and reinstalled properly a few days later. Look closely you’ll see the roofer hanging on at the drip edge of the roof. This steep of a roof in very dangerous to access and install. 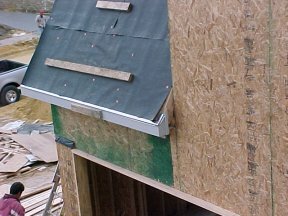 The boards nailed on to the tar paper are called chicken boards by the roofers. There is a small gap in the flashing above this window roof line. 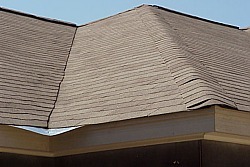 Could cause leaking during heavy rains with high winds.